Three full bedrooms -One king and two queen size beds. bike ride or walk to Bonita Beach or the entrance to Barefoot Beach. among the first to enjoy!!) Four televisions/cable with DVD and VCR. One king size, two queen size beds with television and cable in each bedroom. 12 by 24 heated pool, jacuzzi, outdoor shower and chaise lounges. Lanai equipt with teak furniture, pass through bar from kitchen. Kitchen brand new with granite countertops, dishwasher, refigerator, microwave, calphalon cookware. Washer and dryer. Collection of dvd movies for your use. Fabulous! So looking forward to coming back! Our family of 5 had a wonderful stay at The Bismark. The owners were very prompt is responding to questions during the booking process and the home was lovely. 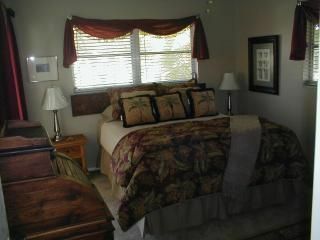 It's conveniently located near the beach, shopping and restaurants and was quite spacious. We definitely recommend it! This beautiful home is an oasis of pleasure, swim in the pool, lounge in the garden walk to many restaurants for dinner (no drinking and driving)or order a pizza or take out to be delivered free. The house is fully equipped with all you need for day to day easy living. A short drive to one of the best beaches in Florida, and to the many attractions this area has to offer. And check out the other properties in the area by this owner, you will be amazed by what these owners have to offer. Ring Gary check out the website. Get started for some real fun in the sun and be like us come back again and again. the amenities of resort living.